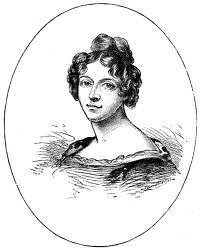 Letitia Elizabeth Landon, or L.E.L as she was known, was one of the most popular poets of the early 19th century. She was a controversial figure in her day. As a woman writer, & a single woman at that, she was sensitive to any rumour of scandal about her honour. Unfortunately there were many unproven rumours from gossips in Society which led to the end of her engagement to John Forster, later the friend & biographer of Dickens. Forster confronted her with the rumours that she had had affairs; she told him to investigate for himself. When he found they were unfounded, she broke off the engagement because she couldn't marry a man who mistrusted her. She married George Maclean, Governor of the Colony of the Gold Coast (now Ghana) & they travelled to Africa after their marriage in 1838. Shortly after, she was found dead, poisoned by prussic acid. Whether she committed suicide or was murdered has never been decided. 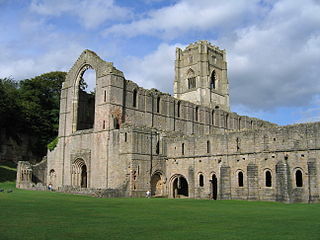 This poem, Fountains Abbey (picture from here), is typical of the gently melancholic Romantic tradition the L.E.L was writing in. It harks back to medieval times when the Abbey was not a picturesque ruin but a part of the religious life of England. When the moonlight falls around. And repined at the solitude. Of an altar no more divine. Of many a wilding rose. May now as in triumph blow. With its beauty to cheer decay. I remember reading Christianna Brand's mystery novels many years ago & I especially enjoyed her masterpiece, Green for Danger. This classic mystery is set in a hospital during WWII & when a patient dies unexpectedly on the operating table after an air raid, the staff of the hospital come under suspicion. It was made into an excellent movie (which I enjoyed watching again last weekend) starring Trevor Howard, Leo Genn, Megs Jenkins & Alistair Sim as Inspector Cockrill. Green for Danger is the only one of Brand's mysteries that has stayed in print so it's very exciting that Open Road Media have released a large selection of her books as e-books. 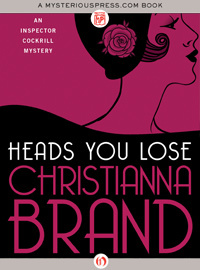 Heads You Lose is the first book in the Inspector Cockrill series. Set in an English village in winter, it concerns a country squire, Stephen Pendock, known as Pen, & his guests. Lady Hart & her granddaughters Venetia, now married to Henry Gold, & Francesca, are old friends of Pen & have been visiting him since the girls were children. When they arrive on a snowy afternoon, just in time for tea, they meet Grace Morland, a neighbour of Pen's who often intrudes on his good nature to paint views of the church tower from his terrace. Grace Morland is a foolish woman, tactless & spiteful. She's in love with Pen, but, completely unaware of his indifference,she sees his politeness as evidence of deeper feelings. Francesca Hart is in her early 20s, beautiful, spoilt & a little hard-hearted. She has been pursued by many men but seems to love her dachshund, Aziz, more than any of them. James Nicholl, another neighbour now on leave from the Army, is also staying in the house. He's in love with Fran but hasn't declared himself. On this visit, however, everyone's emotions will be stirred up. Pen has realised that he's in love with Fran but worries that she sees him only as an old uncle. James sees Pen's feelings & is desperate to tell Fran how he feels before Pen can propose to her but a secret of his own makes him hesitate. Grace Morland is jealous of Fran & is particularly scathing about a fashionably daring hat that Fran has just bought & is showing off. Grace says she wouldn't be seen dead in a ditch in such a hat, realises how rude she's been & takes her leave. As Pen walks Grace home, she becomes more & more hysterical about Fran & the hat but Pen seems oblivious to everything but his own thoughts. Later that night, however, Pen's old butler, Bunsen, returns from a visit to his ailing sister & finds Grace Morland dead in the ditch near the driveway wearing Fran's silly little hat on her decapitated head. Inspector Cockrill arrives to investigate the murder. He's well-known to everyone in the house, being a local detective known affectionately as Cockie. The manner of Grace's death is shocking but just a year ago there had been another murder. A young housemaid was found in the woods, decapitated by a scythe. Her murderer was never found. Could it be the same person? Inspector Cockrill is dubious because the detail of the hat seems to limit the suspects to the six people in the house that afternoon & Bunsen, who knew about the hat & was out of the house at the crucial time. Grace Morland's cousin, actress Pippi Le May, had arrived to stay with Grace on the night of the murder & she thinks that Grace had discovered something that upset her on that night. At first, everyone at the tea party seems to have a alibi as the house was locked securely & only Pen & Bunsen had keys. But, Pippi says she saw a stranger lurking in the woods when she arrived & James had convinced Fran to meet him outside after everyone had gone to bed so the alibis become shaky. The tension is increased by a phone call to Inspector Cockrill threatening Fran's life & then another murder takes place. Another decapitation & this time the body is found in the summer house with no footprints on the snow outside. Heads You Lose is a classic Golden Age mystery. A snowbound village in the depths of winter, a closed circle of suspects with secrets to hide & a detective determined to get to the truth. The murders are a little more gruesome than you might expect in a classic mystery but all the elements are there for a very satisfying plot with enough twists & turns to keep the reader guessing. I admit I was completely wrong about the murderer's identity but then, I rarely get that right. It was a real treat to be able to revisit Christianna Brand's work courtesy of NetGalley. Open Road Media, who are republishing Christianna Brand, are featuring women crime authors on their website in March. Some of the authors published by Open Road include Dorothy L Sayers, Anne Perry, Laura Lippman, Susan Dunlap & Jane Langton, writers whose books I've enjoyed reading very much over the many years I've been a mystery fan. There's more information & a video featuring some of their authors on their website here. 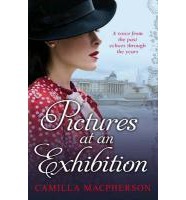 The author of Pictures at an Exhibition, Camilla Macpherson, emailed me recently to ask if I would like to review the book for the blog. I had so much else to read that I said thanks but no thanks. But, the blurb was intriguing & we had copies at work so I borrowed one & I loved it. I read it in just a few days & it was a struggle to put the book down at lunchtime & go back to work. The novel is the story of a young woman, Claire, who has had a miscarriage & can't get over her loss. She blames her husband, Rob, for not being there when she needed him. Her grief is so all-consuming that she has lost interest in her work as well as her marriage. Everywhere there are reminders of her lost baby, Oliver. Then, one day, a parcel arrives that will give Claire a new interest in life. Claire begins reading the letters of a young woman called Daisy Milton who was in London during the Blitz. Daisy was writing to Rob's grandmother, Elizabeth, in Canada & the letters have been left to him in his grandmother's will. 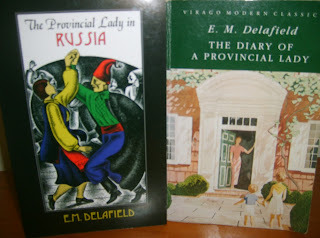 The letters are full of Daisy's life in London, the horrors of the Blitz & the boredom & irritations of life in wartime. Daisy decides to visit the National Gallery every month where one painting from the collection was displayed (everything else was stored in caves in Wales for safe keeping) & she describes her visits & the paintings in her letters to Elizabeth. This was part of a Government project to keep up morale which also included a famous series of lunchtime concerts by renowned pianist Dame Myra Hess. Claire decides to follow Daisy's example & each month after reading Daisy's letter to Elizabeth she visits the painting in the National Gallery. She becomes fascinated by Daisy's life as well as her reactions to the paintings on display. Daisy was engaged to Charles, a young man about to be sent overseas to North Africa. Charles has a very conventional idea of their future. They will live in a house in the country & Daisy will look after the children & the house while he earns a living. Daisy isn't entirely sure that this is the future she wants, or at least, not yet. She enjoys working, although she struggles to see how her work as a typist in a Whitehall ministry is helping the war effort, no matter what her boss says. One day at the Gallery, Daisy meets Richard Dacre, an artist who has a commission as a war artist. They begin meeting at the Gallery to look at the paintings & Daisy knows that she's falling in love with Richard. Her letters to Elizabeth become a way of working through her feelings about Charles & Richard & the decisions she makes that will affect them all. Claire & Rob grow further apart & she meets a man at the gallery who is obviously attracted to her. Dominic is handsome, knowledgeable & confident & soon Claire has confided in him about Oliver & her marriage as they drift towards an affair. Claire finds she has to make some decisions about her future as Dominic pursues her & Rob seems to have given up waiting for her to forgive him & let him back into her life. The parallels in the lives of Claire & Daisy are highlighted by the paintings both women see. This is what makes Pictures at an Exhibition stand out among the many novels set in two different periods. If you have an iPhone, you can scan a QR code at the beginning of each chapter to see a reproduction of the painting. I just searched for them on my iPad. The paintings include Botticelli's Mystic Nativity, Apollo and Daphne by Pollaiuolo, Madonna of the Basket by Correggio & Constable's Weymouth Bay. The paintings provide a link between two time periods & two women whose lives are at a crossroads. Claire isn't always a sympathetic character as her absorption in her own grief shuts out Rob as well as her family & friends. She finds a way to deal with her emotions through becoming absorbed in Daisy's story & she begins to heal. Her search to find out more about Daisy & what became of her helps her to reconnect with her own life & accept her loss. I'm very grateful that Camilla Macpherson emailed me because I hadn't heard of her book & I probably wouldn't have found it without that little push. I always find it interesting to think about how I decide what to read next. Even though I had so much to read I was intrigued enough to download a sample from Amazon & then get hold of a copy from work. Serendipity has a lot to do with my reading choices & this was an especially fortunate example of that. This is a very Romantic ballad full of love & adventure. A young couple, eloping on a stormy night, crossing the loch with her father & his followers close behind them. We know it isn't going to end well! Thomas Campbell (picture from here) was born in Glasgow in 1777. He was well-known for his sentimental poetry about love & tragedy that suited the taste of the time. The vogue for Scotland's romantic history created by the poetry & novels of Sir Walter Scott suited Campbell's strengths as a poet & this poem, Lord Ullin's Daughter, is a lovely example of his work. The Ruth Galloway series is one of my favourites. Ruth is a forensic archaeologist, a specialist on bones & university lecturer. She's overweight & not too fussed about it. Single mother to 18 month old Kate, in a lukewarm relationship with Max, best friends with Cathbad, a Druid & Kate's godfather, & in love with Kate's father, DCI Harry Nelson. Ruth & Harry had a one night stand during the murder investigation that first brought them together & Kate was the result. Harry is good at his job although he's not too sure he likes living in Norfolk. He's married to Michelle, has two daughters & his feelings for Ruth range from irritation to protective affection. 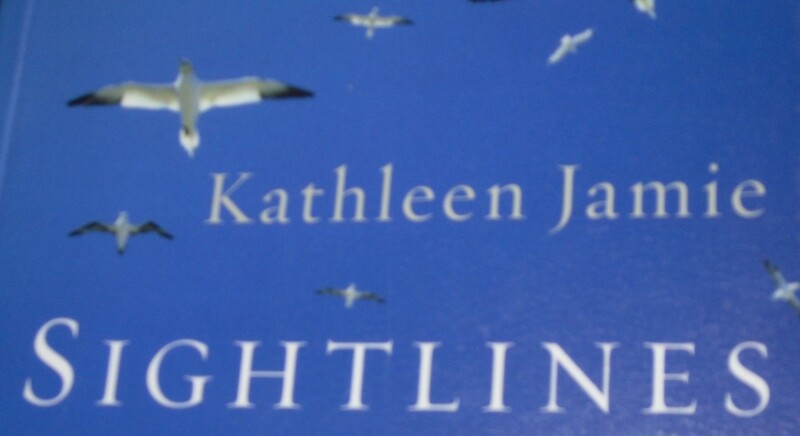 He loves Kate & is determined to be part of her life, even though he disapproves of Ruth living in an isolated house on the remote salt marshes & keeping him at arm's length. When Ruth hears that Dan Golding, a fellow archaeologist she knew at university, has died in a house fire, she is sorry that she lost touch with him & the rest of their group. Dan was a charismatic man & Ruth had been a little in love with him. When she receives a letter from Dan on the day she hears of his death, she is shocked & then intrigued. Dan wants her advice about some skeletal remains he's found in the Pendle area of Lancashire. His letter is excited but also disturbing as he tells Ruth that he's found the Raven King & he's afraid of someone or something as a result. Then, Ruth is contacted by the head of Dan's department at Pendle University & asked to examine the bones Dan found in a post-Roman tomb. She also discovers that Dan's death wasn't an accident. The fire was deliberately lit & the door was locked on the outside so Dan had no chance of escaping. His laptop with all his notes of the excavation & mobile phone are also missing. Ruth decides to take her summer holiday in Lancashire along with Kate & Cathbad. Ruth had asked Nelson to find out more about Dan's death as his old mate Sandy McLeod from Blackpool CID is in charge of the investigation. Nelson doesn't enjoy holidays but he decides that this year, he'll go back to Blackpool with Michelle so they can visit their families & he'll be on hand to help the investigation into Dan's murder. He doesn't know about Ruth's plans & there are some awkward moments when Ruth & Kate come face to face with Nelson's mother & sisters. Ruth is immediately intrigued by the archaeological evidence when she arrives at Pendle University. The second-rate institution seems such an unlikely place for Dan, the Indiana Jones of UCL, to have ended up. His department is very much on the fringe, underfunded & unappreciated. His colleagues tell Ruth how sorry they are about Dan's death but she's unsure how sincere they are. The remains Dan discovered have been taken to a forensics lab for sake-keeping & Ruth is shocked to discover that they've been replaced with parts from two different bodies. She's even more surprised to learn that Dan believed that the remains were those of King Arthur & that a white supremacist group called the White Hand, devoted to the Norse myths & the memory of Arthur, could be angered by the implications of Dan's discovery. Dan had received hate mail from the group & the police think they could have been involved in his murder. When Ruth starts receiving sinister text messages warning her off, she is spooked but not deterred from investigating Dan's death & the mystery of the bones. The White Hand aren't the only suspects as Ruth learns more about Dan's tangled personal relationships & also about the financial rewards his discovery could have brought to his cash strapped department. 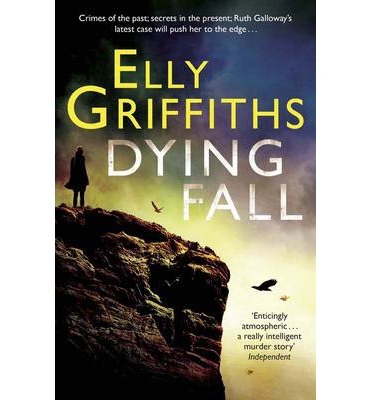 Dying Fall is a terrific, fast-paced mystery that I read in virtually one sitting. Ruth & Nelson are immensely appealing characters. Their tangled personal relationship is always interesting as they're decent people who don't want to hurt anyone but are obviously meant to be together. Ruth's Druid friend Cathbad has also become an important part of Ruth's circle. His relationship with Nelson's colleague, Judy, is still unresolved & his friendship with a fellow Druid, Pendragon, plays an important part in the plot. The mix of archaeology & history with a present day mystery always appeals to me. Like Kate Ellis's Wesley Peterson series, they combine three of my favourite subjects. I have Kate Ellis's latest, The Shadow Collector, on my desk at the moment so I have another treat to look forward to there. The King Arthur thread was also interesting to me as I'm currently reading another book on the same subject but non-fiction rather than fiction. King Arthur's Battle for Britain by Eric Walmsley describes the author's extensive research into the locations of the twelve legendary battles Arthur is said to have fought all over Britain in the shadowy years after the Romans left in the 5th century. I'll be reviewing it soon. One of my reading plans this year is to get back to reading short stories. I have many collections of stories on the tbr shelves - 53 of them if you can believe Library Thing - & I want to read some of them this year. Another of my plans for the year is to read my unread Persephones. I don't have many of those, only 10, but the new books for Spring will be out next month & I would like to read my Persephones when they're published rather than see them slip down the reading pile as so many books tend to do. As there are several collections of short stories on the Persephone shelf, they will be the first stories I read. 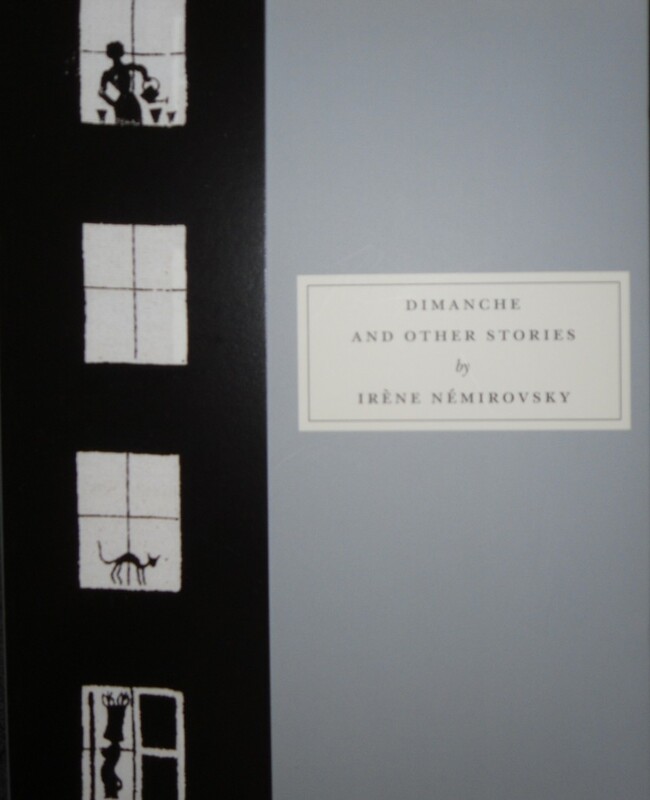 Irène Némirovsky's work was rediscovered some years ago when her wonderful novel, Suite Francaise, was published. Irène Némirovsky died in Auschwitz & her daughters carried the manuscript of her final work around with them in an old suitcase for years without being able to bring themselves to read it. When it was published, it was a sensation & several more of her novels have been translated & reprinted since. Writing about collections of short stories is difficult. It's hard to write a review of a story without giving away too much plot so I'm going to concentrate on one story in each collection. My favourite story here was also the longest, Liens du sang (Flesh and Blood). This is the story of Anna Demestre, a widow with three grown-up sons & a daughter, Mariette. Anna is a demanding old woman, dismissive of her daughters-in-law & clinging on to the tradition of the weekly Sunday dinner which all her family attend, more out of a sense of duty than out of love. Albert & Augustin are in their 50s, reasonably well-off & reasonably happily married. The youngest son, Alain, is the most dissatisfied. 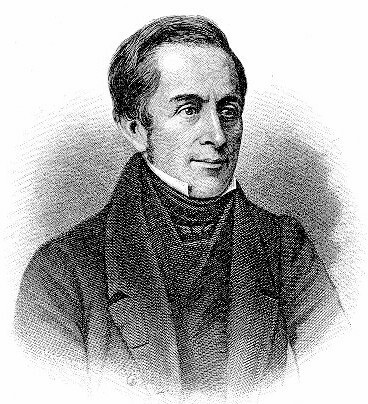 He has married Alix, whose sister Claire is married to Augustin. Alain has never been in love with Claire & he feels increasingly stifled by his life. He has a plan for escape that needs financial help from his brothers. Albert & Augustin are dismissive, telling Alain to grow up. Augustin also realises that he will be left to pick up the pieces, caring for Alain's wife & children if he leaves. Mariette has led a sad life. She married an older man, divorced him &, now in her 40s, has begun to look faded after a series of unhappy love affairs. She was one of those delicate blondes who, on reaching forty, appear to wither overnight, like a corsage of flowers worn to a party. The siblings are always pleased when their weekly duty is over & they can return to their own lives. However, when Anna falls ill & suddenly takes a turn for the worse, they are brought together through one long night as they wait by their mother's bedside. Throughout the night, memories are revived, secrets are disclosed & promises are made. I loved this story. The picture of the dutiful children & the miserable old woman was beautifully presented. The daughters-in-law sitting together on the same sofa every Sunday emphasized their fate as outsiders. The brothers reverted to their childhood roles. Albert & Augustin, the older, more responsible & boring pair, lecturing Alain on his thoughtlessness & lack of prudence. Alain's expectation that he has the right to ask his brothers for financial help no matter the consequences & their assumption that Mariette, as the daughter & the one without family ties will come back home to look after their mother should she survive her illness. Alain's desperation as he tries to grab happiness no matter how uncertain it might be. There were so many telling moments when the facades of their lives cracked & the truth peeped out. 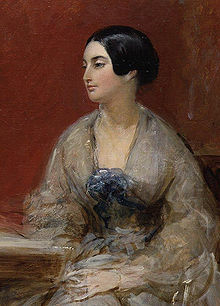 Caroline Norton (picture from here) was one of the most remarkable women of the 19th century. Trapped in a miserable, abusive marriage, she left her husband. Her husband sued Lord Melbourne, a friend of Caroline's & the Prime Minister of the day, for criminal conversation which really meant adultery. Although the claim was dismissed, the scandal was enormous & Caroline was left in limbo. By the laws of the time she had no right to her own earnings or to the custody of her children who she was forbidden to see. She became a social reformer, working for laws allowing women to obtain divorce & giving them rights over their children & their own property. Her work led to the passing of the Custody of Infants Act (1839) & the Matrimonial Causes Act (1857). She was also a poet. Much of her work was written to publicise the causes she was so passionate about. Even though this poem, The Faithless Knight, is in the style of an antique ballad, the theme of faithless love is poignant. I have a biography of Caroline on the tbr shelves & I would love to learn more about her life. The book I have is by Alan Chedzoy & there's a more recent biography by Diane Atkinson. She's also featured in Margaret Forster's excellent book on 19th century feminists, Significant Sisters. With a beating heart, and a smother'd sigh. While a quivering smile on her red lip plays? 'Tis her own dear knight--will he not look back? There are tears on her cheek--like the dew on a flower! As she watches the spot where he last has been. Ere that steed and its rider return again! 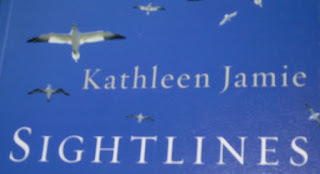 Kathleen Jamie's writing is beautifully calm & thoughtful. They're the adjectives I would use to describe this lovely collection of essays which all hinge on the idea of seeing. I find the best way to read essays or short stories is to read one a day so that I have time to mull over the words & the images that the best essays & stories call up. I haven't read any of her poetry but I think that must be my next step. The other attraction of Jamie's writing is the setting. Most of the essays are about Scotland. The most evocative writing is about Scotland. She writes about staying on the remote island of Rona, out in the North Atlantic, on the way to Iceland. She is going there with a couple of scientists, one an archaeologist, to observe the bird colonies & plotting the grave markers in the churchyard of St Ronan's chapel, to record the damage of the elements. She describes how she helps Stuart, the ornithologist, count the number of nests of the rare Leach's petrel.The birds nest in the field walls of the ruined village & Jamie is instructed to give three blasts from a Walkman with a recording of the bird's call on it "anywhere that looks likely" & listen from the response if there's a bird on the nest. She soon learns to pick the likely places but Stuart is worried about the much smaller numbers of nests than on his last visit, ten years before. Another essay describes three visits to the remote island of St Kilda. St Kilda has become an iconic place. Once a place where a few crofters made a precarious living scaling the cliffs for birds eggs, the last inhabitants asked to be evacuated from the island in the 1930s. The conditions were just too hard & the young people had all left for the mainland in search of work. The island is now a bird sanctuary managed by the National Trust & it's become a dream destination for bird fanciers. On the first attempt, the weather turns the boat back, disappointing the tourists who have come from all over the world to see the birds. A couple of years later, Jamie tries again, chartering the same boat & anxiously watching the weather forecast. This time, they get there but have to leave early due to a worsening weather forecast. Jamie just has time to take in the radar base on the island, tracking possible missile launches & the little museum with its photos of 19th century men & shawled women. Eventually, a few years later, Jamie goes to St Kilda as part of a group of scientists surveying the cultural landscape of the now World Heritage site. The ruined village narrowly escaped destruction when the army built the radar base & now the Heritage listing means it can't be touched. There are also ancient, possibly prehistoric structures called cleits, to be surveyed. Cleits were storehouses, made of drystone & roofed with turf. Deciding how old the cleits were is a problem. As one of the archaeologists says, "The Stone Age went on until 1930!" Whales are a constant presence in the book. Watching a group of killer whales circling an island, musing on the giant whale jaws set up as gateways in former whaling ports. My favourite essay was about a visit to a museum in Bergen. The Hvalsalen, the Whale Hall, was in the process of restoration. The many whale skeletons collected & displayed in the 19th century are being cleaned & repaired. The size of the skeletons raises many questions. How were the specimens collected? Were they the results of whaling, deliberately hunted for the purposes of being displayed in the Museum, or were they whales that had been stranded? Even more interesting, how did they get the skeletons up several flights of stairs to their final resting place? The meticulous cleaning of the bones will take months using ammonia, toothpicks & a washing-up brush. Imagine tackling the cleaning of the skeleton of a blue whale with such tools. There's so much of interest in this essay. The wonder of the exhibits - 24 cetaceans suspended from the roof of the Museum. The sheer size of the whales & the beauty of their buttery colour & graceful sweeping bones. The troubling questions about the history of the whaling trade, the immense damage done to whale populations that still goes on today, although at a smaller scale. The dedicated work of conservation being done by the team of young workers, none of whom have ever seen a live whale. It was a privilege to be able to see this place & all the journeys in this book through Kathleen Jamie's eyes. The excitement about the discovery of the remains of Richard III in Leicester has sent me back to my books about this most enigmatic of men. I've recently reread Josephine Tey's The Daughter of Time, a book that often inspires Ricardian worship in those who read it at an impressionable age. I then read David Baldwin's biography of Richard which is about to be reissued as a paperback with an additional chapter on the discovery. Then, I was fortunate enough to be able to see the documentary, The King in the Car Park, as someone had loaded it onto YouTube. John Ashdown-Hill, a historian, genealogist & member of the Richard III Society, featured in the program & I remembered that I had his book, The Last Days of Richard III, on the tbr shelves. It was John Ashdown-Hill's research into the mitochondrial DNA of Richard's family that led to the discovery of a direct descendant of Richard's sister, Anne of York. It was this man, Michael Ibsen, who provided a DNA sample to be compared with the DNA retrieved from the remains found on the site of the Greyfriars church. There's a fascinating chapter in this book that explains the significance of mitochondrial DNA (DNA that is in the female line) & outlines the genealogical research that was undertaken to track down the female descendents of the Yorkist family to the present day. 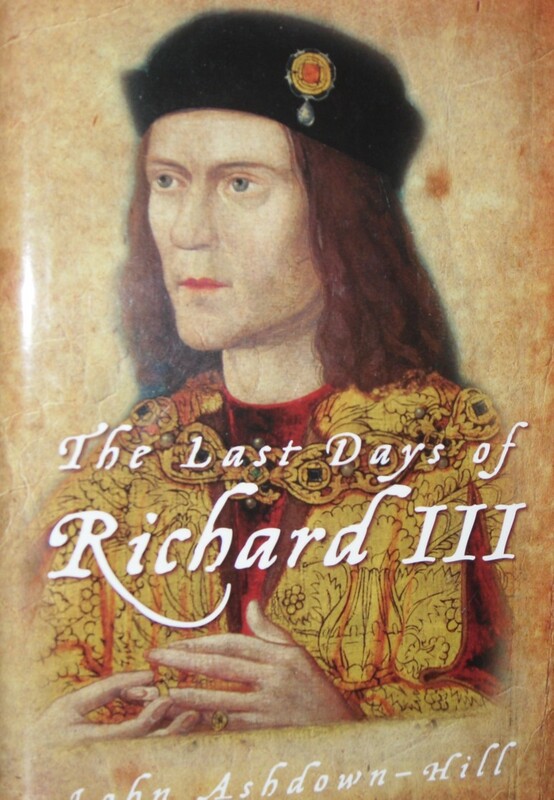 The Last Days of Richard III is also different from other biographies of Richard III because Ashdown-Hill looks primarily at the last 100 days of Richard's life, from the death of his wife, Anne Neville, to the Battle of Bosworth & the aftermath. Most accounts of Richard's reign are written with hindsight & imagine that Richard was full of foreboding as the invasion of Henry Tudor drew nearer. Shakespeare's play, which dwells on the King's growing paranoia & suspicion, has a lot to do with this. The final scenes before Bosworth with Richard tossing restlessly in sleep, tormented by the ghosts of his victims telling him to Despair & Die are intensely dramatic but they have little basis in fact. But, of course, Richard had no knowledge of the outcome of Tudor's bid for the throne. He was King of England & had every reason to believe that he had a long reign ahead of him. Henry Tudor had attempted an invasion before & had failed. Richard was looking forward to Tudor's next attempt so that he could defeat him & end the Wars of the Roses once & for all. Far from dreading the future, Richard was making plans for the continuation of his family line. The death of his son, Edward, & his wife, distressed him but he was all too aware of the perils of an uncertain succession to the throne & he was making plans for a second marriage in these months before Bosworth. Richard was proposing a marriage with a Portuguese or Spanish princess as both royal houses were descended from the marriage of John of Gaunt (son of Edward III) with Constance of Castile. Richard was therefore hoping to unite this Lancastrian family line with his own Yorkist line to reconcile the competing factions. He was also proposing a Portuguese marriage for his niece, Elizabeth of York, who with her mother, Elizabeth Woodville & her sisters, had emerged from sanctuary. Richard had promised publicly to look after the girls, who were now seen as the illegitimate daughters of Edward IV, & arrange suitable marriages for them. Part of Robert Herrick's former garden now comprises a Leicester car park, and probably Richard's bones still lie in this vicinity, just where they were buried in August 1485, perhaps concealed beneath the modern tarmac. Well, he was right! Thanks to the careful research & persistence of Ashdown-Hill & Philippa Langley, Richard's remains have been discovered & I look forward to the many books & articles that will result from the ongoing investigation. This is a poem I remember reading many years ago but, now that I look at it again, I realise what a sad, melancholy poem it is. Thomas Hood (picture from here) was a poet & humorist, fond of practical jokes & puns. 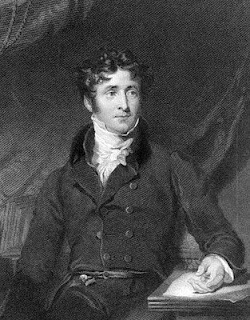 He was sub-editor of the London Magazine & knew many of the writers of the early 19th century, including Coleridge, Lamb, Clare & de Quincey. Finding out a little about him makes me feel that this poem, with its yearnings after the innocence of youth, must have represented a passing phase rather than a settled melancholia. If you'd like to have a peek at my bookshelves, pop over to Dani's blog, A Work in Progress. I'm very pleased to have been asked to contribute to her ongoing series Lost in the Stacks where she invites bloggers to talk about their collections & reveal their bookshelves. I've read two of Martin Edwards's books featuring Liverpool lawyer Harry Devlin over the past couple of weeks. I Remember You & Yesterday's Papers. I Remember You is a story of murder & deception with its roots in Northern Ireland. Finbar Rogan, one of Harry's clients, is having a run of bad luck. His tattooing business is burnt down, he thinks he's being followed & a bomb is found strapped to the bottom of his car. Finbar has plenty of enemies from his ex-wife to various disgruntled husbands & boyfriends whose women he's seduced. The story also involves a local radio station that features local personalities on the morning show to discuss the news & play a few favourite songs - on one memorable occasion, Harry is featured. The story is fast paced &, as always, well-plotted. Harry is an immensely sympathetic character, still mourning the death of his wife, Liz, two years before & not ready to move on emotionally from her loss. He's never going to be highly paid but he's honest, compassionate & always does his best for his clients, even if that means getting too involved in their affairs & doing a little investigation on the side. Yesterday's Papers begins as Harry meets Ernest Miller, an elderly man who has been researching a famous murder case of the 1960s. Carole Jeffries, a beautiful 16 year old girl was found dead in Sefton Park near her home, strangled with her own scarf. Edwin Smith was convicted of Carole's murder but before he could be executed, he committed suicide in prison. Now, all these years later, Miller is convinced that Edwin Smith was innocent. He was an inadequate young man who fancied Carole but had never had a chance with her. He was an easy & obvious suspect & Miller thinks the police didn't look any further once they discovered that Smith knew some details of the murder scene that only the killer could know. Miller wants to look at the legal files of the case & Harry's firm has just bought the practice of Smith's solicitor, Cyril Tweats. Tweats was an incompetent lawyer but amazingly stayed in business until retirement. Harry is intrigued & agrees to look through Tweats's notes on the case. Against his will, he becomes involved, even though he finds Miller's interest in the case a little distasteful. Carole's murder had a devastating effect on her family. Her father, a prominent political writer & lecturer, was crushed by his daughter's death & began drinking which destroyed his career. Several other men, including Carole's pop star boyfriend, her employer, Benny Frederick & Clive Doxey, a family friend but now a prominent justice campaigner, could all be in the frame if Edwin Smith was innocent. Harry becomes increasingly intrigued by the case &, after Ernest Miller's death from a fall during an asthma attack, he discovers the source of Miller's information about the case & begins to wonder if his death was a little too convenient for one of the men he now suspects may have been the real killer of Carole Jeffries. This is the most complex of the Devlin books so far. Martin Edwards wrote a post about the book on his blog just a couple of weeks ago & he says that it was a new departure for him. It's a story with several strands & more than one murder to be solved & not all of the murders are in the past. The atmosphere of 1960s Liverpool, home to the Beatles & the Mersey sound, is beautifully described & Edwards obviously has a great nostalgia for the period & its music. Luckily I still have three more Harry Devlin books to read & I'm so pleased that the digital revolution has lead to the series now being available as ebooks. I'm also lucky enough to have a pre-publication copy of Martin's latest book in the Lake District series, The Frozen Shroud, courtesy of NetGalley & I can't wait to read that. Katie Fforde's books are always a treat. Romantic, funny, & often highlighting a very English preoccupation - canal boats, furniture restoration, auction houses or TV cooking shows. This time it's antiques. Gina & Sally Makepiece inherit a stall in an antiques market called the French House. Their Aunt Rainey was an eccentric life force & she wants the sisters to have a go at running the stall even though neither knows anything about antiques. Sally is a designer of crafty knick-knacks currently preoccupied with her twin daughters. Gina is in PR & she's just moved to the country to be near her sister after a painful breakup with her cheating boyfriend. The owner of the French House is moody, taciturn Matthew Ballinger. He agrees to help Gina & Sally with the stall because he was fond of Rainey but it's obvious that he thinks they have little chance of making a go of it. The French House is home to an engaging group of dealers & artists who rent space there but, since the death of Matthew's father, the spirit seems to have gone out of the place. Gina immediately sees the potential of the house but she has a hard time convincing Matthew to try any of her ideas from Sunday opening to a Christmas fair. He does, however, agree to take her along to a few antiques fairs & help her get started. Although Gina is definitely not looking for a relationship, she can't help but be attracted to Matthew who is darkly attractive if moody & mysterious. Although Matthew loves the French House & is reluctant to let his tenants down, he is also worried about his financial position. His ex-wife, Yvette, is clamouring for the rest of her settlement & she has a friend who is eager to buy the French House & set up her homewares business. As Gina & Matthew's relationship moves from tentative friendship to passionate romance, Gina becomes even more determined to find a way to save the French House. She also becomes increasingly interested in antiques & her sales skills are a definite asset. After a blissful trip to France where Matthew is unfortunately unable to reason with Yvette, Gina decides to come up with a plan to save the French House from sale. The only problem is that Matthew is furious about her idea & their relationship suddenly turns from fire to frost. A French Affair is a gorgeous book, perfect for reading in one long afternoon, as I did. Gina is a lovely character. She's warm, kindhearted & outgoing. She's determined to honour Aunt Rainey's legacy, even when she thinks the idea is completely mad & her growing feelings for Matthew are equally confusing & exhilarating. The country town setting, together with antiques & the trip to France, is just perfect for this kind of romantic story that Katie Fforde writes so well. 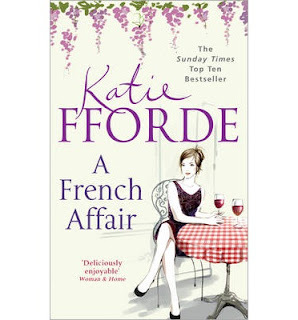 I read A French Affair courtesy of NetGalley. To celebrate Barbara Pym's centenary year, Thomas at My Porch is organizing Barbara Pym Reading Week in the first week of June. I've already reread Excellent Women & A Glass of Blessings this year & plan to reread a few more of her wonderfully witty, funny, touching novels over the course of the year. For Barbara Pym Reading Week, I plan to read Quartet in Autumn, the Pym I've been holding on to just so I could say I hadn't finished reading all her books just yet. Thomas has created some beautiful buttons to celebrate Barbara Pym Reading Week. Just click on the link to his blog above & have a look at the buttons & read all about it. Everyone knows the first two lines of this poem, Casabianca, by Felicia Hemans (picture from here), so I thought I'd post it this week so we can all read the rest. Hemans was a very famous poet in her time but this is probably the only poem of hers that has survived. Casabianca is the name of the 13 year old boy, son to the ship's captain, who, during the Battle of the Nile, stayed on board the burning ship while everyone else escaped. He was waiting for his father's permission to leave his post but, unfortunately, his father was dying below decks. Whether the incident ever happened has been disputed but the poem was very popular as a recitation at concerts & in the schoolroom for many years. The boy -- oh! where was he?